Whether getting ready for the day or getting refreshed at day’s end, we spend countless hours enjoying the pleasure of indoor plumbing in our bathrooms – a pleasure people in the early 19th century could only find in the most luxurious hotels. 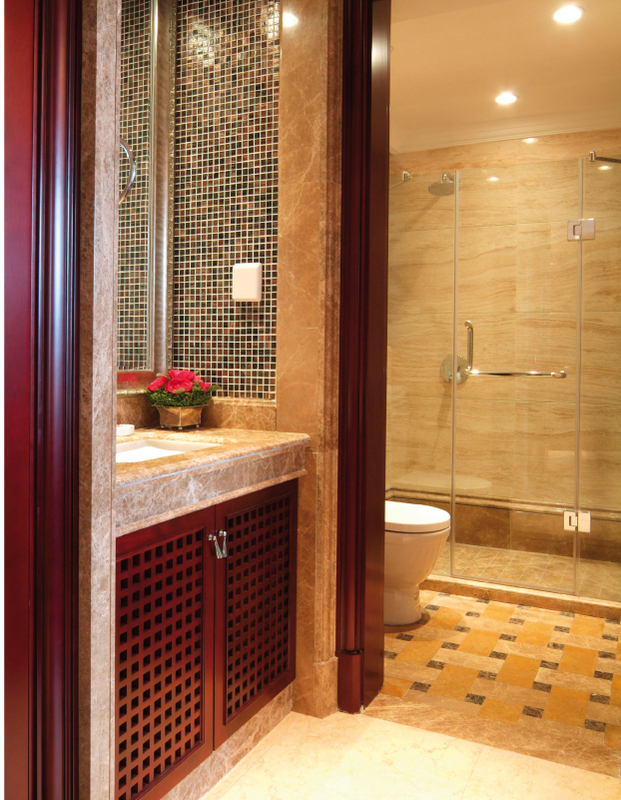 While most of us think of our bathrooms as necessities rather than luxuries, that luxury hasn’t been lost altogether. Options abound that can turn an average bathroom into an oasis of comfort and leave you feeling like a resort’s special guest. hard to deliver the most durable and stylish products. Sidney B. Allen, Jr. has been building custom homes in the Lynchburg area for more than three decades and has learned what’s most important to homeowners in bathroom design: functionality and a custom look. “Practicality has to be first and foremost; you have to make it work,” he said. Most people dive into a bathroom remodel because they have outdated fixtures that are worn out or they want to upgrade to new items such as a whirlpool tub or ceramic tile in the shower he said. People also remodel for mobility issues brought about by aging. Whatever their reason, oftentimes the first mistake is “trying to do too much in too small a space,” he said. Our bathrooms generally are the smallest rooms in the house. Working in a tight space where so much activity occurs every day is a big challenge. 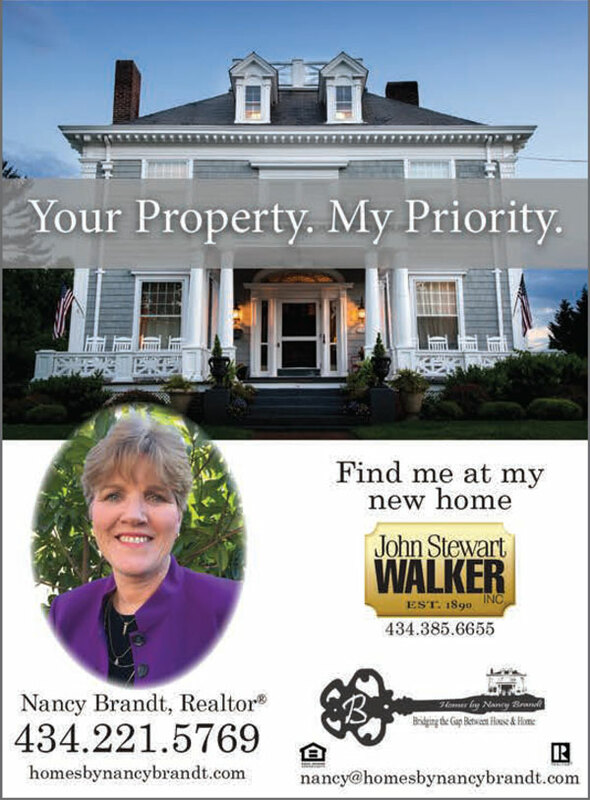 Allen said for the larger jobs, a licensed contractor will guide homeowners on what they can do with the space they have, taking into consideration the existing plumbing, wiring, and floor space. Scott Tyree of Tyree Plumbing, Inc. said the reality is what looks like a simple job can turn into something much larger when the plumbing system is exposed. Just because someone sees their dream bathroom in a magazine or on a home makeover show, doesn’t mean that dream can come true in that exact way. But with some flexibility, mixed with a little creativity, a new look can be achieved that will be a perfect fit for your home. Allen said sometimes space can be borrowed from a bedroom or even from a closet if it is absolutely necessary, as there are more storage options for bathrooms — custom vanities, cabinets, and shelving — than ever before. Often, a large vanity can be given up for a pedestal sink instead, freeing up several feet of space. The best way to know if your goals are attainable is to visit a showroom and explore the designs firsthand, he said. “Take some time, look around, know what your options are and be willing to compromise with your space,” Allen said. Be leery of contractors who want to install their own products they just happen to have on hand; licensed and insured contractors, plumbers, and electricians should be willing to work with you to find your own style of products. While home improvement and hardware stores carry several options, you will find much more in the way of fixtures at a plumbing specialty stores. And if space is still at a minimum, as well as your budget, borrow some tricks from interior designers to create the illusion of an “enlarged” room: choose a light paint color for the walls or paint the ceiling a bright white and add crown molding. Choose a light-colored floor, with larger tile squares, to make the room feel bigger. The right lighting can make a difference, too: switch to CFL bulbs for a brighter, more natural light; remove curtains from windows (if your privacy isn’t compromised, that is), or if you can spring it, add a skylight. Large wall mirrors over sinks and three-way mirrors also visually enlarge a small space. After exploring showrooms and talking with a contractor and/or plumber, it is always a good idea to contact a licensed electrician because there are so many rules and regulations on electrical outlets and fixtures in a wet space. For example, Fred Hickey of Hickey Electric said a wet-niche fixture with a gasket must be selected for recessed lighting over a shower. Standard in every bathroom is a ground-fault circuit interrupter, a type of outlet that senses any imbalance and stops the electric current to prevent shock. Electricians can also service or install new ventilation fans, helping to preserve walls, cabinetry and just about anything else that can be damaged by moisture. A popular upscale option is a remote fan, which is located in the attic (no more of that bothersome noise!). One of the preferred brands is NuTone, which offers all varieties (including the remote fan) with energy-efficient options and even automatic sensing to detect moisture. Panasonic makes a vent fan that is extremely quiet, he said, complete with a built-in motion sensor and humidity sensor, so it only runs when needed. Hickey said today’s homeowners are concerned “with energy savings as well as price” when renovating a bathroom. He urges people to stick within a budget, adding items as you can to enhance the space. 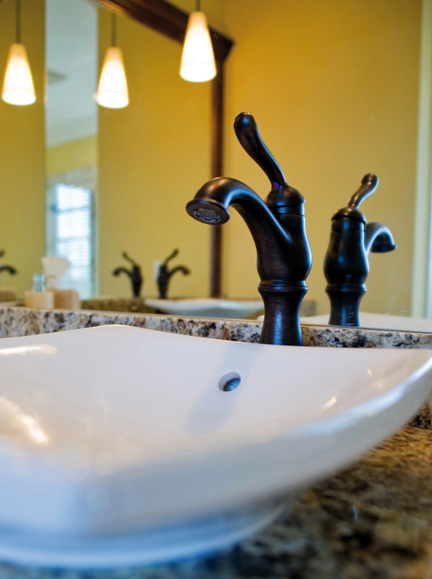 Tyree said sometimes it can be as simple as adding a new toilet or a new vanity counter top. 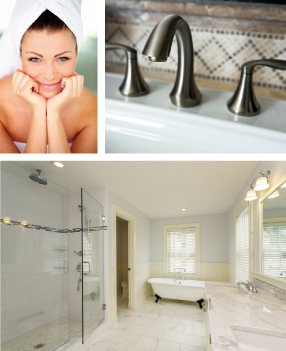 Changing out faucets that have lost their shine is another low-cost option. “Lots of times an older tile bathroom with great cleaning, a fresh coat of paint, a new shower curtain, new towels and accessories can give you a fresh new feel on a tight budget,” he said. Perhaps the biggest decision you will make is where you will bathe in your new bathroom. Bathroom remodelers are seeing more people give up the bathtub in exchange for more shower space. And that makes perfect sense because most of us are living lifestyles that are too busy for lengthy, candlelit bubble baths. A quick shower, and we’re off. You might work yourself up into a lather when you visit a showroom and see the huge variety of nozzles and faucets. Popular options include body sprays (a jet massage spraying from the sides of the shower); multi-setting shower heads (including the much-in-demand rain spray option); hand showers on slide bars, and double-head shower faucets. Consult with a plumber first to see if this is an option for you. Showers with built-in seating are not just for those with mobility issues anymore; you will see more styles that come with seats to make showering and shaving easier. A luxury therapy item, steam showers are gaining in popularity. A generator (often hidden under a vanity or behind a wall) can be activated with a push of a digital control button. Sitting on a bench in your shower, you can sweat away the stress of the day under scented vapors. Many tout the benefits of a steam bath for your skin and sinuses. Once installed, a steam shower doesn’t incur much additional cost: a 20-minute steam bath only uses about 2 gallons of water (versus 50 gallons for a 20-minute shower). After a quick rinse, you are certain to feel rejuvenated. Should you need it, you can also have a therapeutic tub installed, the same type used by physical therapists. Many people justify the expense of one by weighing the cost of going regularly to therapy versus the in-home convenience of having your own. Cast-iron tubs were trendy in the last few decades, but more people are trading them in for shower stalls for practical reasons—not everyone can climb over the side safely. Tubs are not out altogether, though. Many people still enjoy their soak in a garden tub. These high-end items are installed mostly in new construction (because space has already been allotted for them). Whirlpools and Jacuzzis may not be the best for the budget-minded, since they can run up a water bill very quickly just to fill them. If you still need a tub for children, acrylic may be the best way to go. Many companies that specialize in tub overlays use acrylic for its virtually maintenance-free quality. The non-porous material will never fade, crack or get dull. An overlay is comparable in price, or less, than a complete tub refinishing job (less mess, too). People with acrylic tubs have said they never have to scrub; a little Windex and paper towel is often all that is needed. Some of the newest bonus-features in bathrooms can greatly add to your comfort level when you step from a hot shower into a cold room. Heated floors are perhaps the latest-and-greatest addition to the market. A separate thermostat operates an electric mat installed under tile. “Heated floors and heated towel bars are wonderful when the budget allows,” Potter said. And remember those outdated red-coil heat fixtures overhead? They are still available, but modernized versions now come with the addition of ventilation fans and can also include lights for a three-in-one deal. For those who secretly wish to be royalty, a heated toilet seat on a cold night is most welcoming; some even come with nightlights! As you can “have it your way” with a burger and order your coffee with a list of special instructions, you can do the same with your bathroom. Where you tidy up is the most private room of your home and it ought to include those special, personal touches. Pictures of family members? Why not? I have a favorite photo of my kids playing in a bubble bath that still makes me laugh when I see it. Add your favorite fragrances, use your favorite colors, steal some fresh flowers from the dining room. Replace those ever-thinning bath towels that were wedding gifts long ago with a livelier pattern and brighter colors, perhaps paired with new hand towels. Why can’t bathrooms have a conversation piece, too? If you are a sucker for local pottery like I am, some pottery shops sell homemade sink basins that can add a personal touch. Changing out cabinet knobs, towel racks and outlet covers to a fancy, fun style can quickly add some flair. Committing to a new look in your bathroom may take some time, but you can’t plan too much for a room that you use every day; you will be glad you took the time to get it right in the end. And maybe you’ll be lucky enough to find the time to lather in your own lap of luxury.